Near the Louvre, the talented Daniel Rose delivers an everchanging menu. Dinner Tues.-Sat. 6:30 p.m.-10:30 p.m.
: Spring’s fine reputation comes from its chef, Daniel Rose. A native of Chicago, he worked for a year with Yannick Alléno at Le Meurice before opening his own restaurant in 2006, near Pigalle. 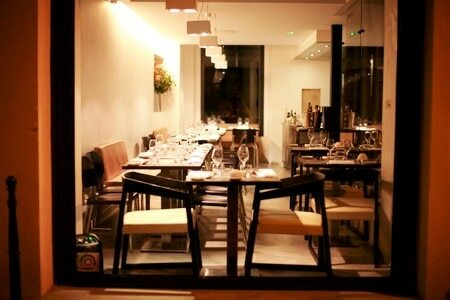 Relocated close by the Louvre since 2010, the restaurant now occupies a three-tier space. Rose makes a strong impression with almost improvised courses, finely highlighting the products. The dinner menu features four courses for €84. We liked the assortment of appetizers that, the day of our visit, were radishes, truite gravlax sprinkled with horseradish, and rabbit rillettes and herb butter. Then we enjoyed a red snapper à la plancha in a truffle vinaigrette with daikon. Steamed egg broth, served on the side, proved an intriguing accompaniment. As to the roast lamb shoulder, the meat melted on the palate, seasoned with a gingerbread and date compote, with watercress salad and pommes dauphine. As a finale, we sampled roast and pan-fried slices of Fuji apple, a sheep’s milk sherbet perfumed with cocoa, and a salad composed of passion fruit, mango and litchi. Wine dégustations are sometimes organized in the cellar, which is endowed with 200 samples. A few wines are available by the glass, like a Saint-Romain Sarnin Berrux 2010 for €14, and a robust Crozes Hermitage 2010 from David Reynaud for €10.